Fructose is a dietary sugar that is found in a number of naturally occurring foods, most particularly, fruit. 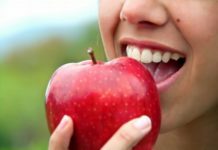 Eaten in moderation, especially when ingested as a complex foodstuff (e.g., an apple), it is not harmful. On the other hand, high fructose ingestion appears to have a number of adverse health effects, including obesity and high triglyceride levels. Several recent scientific publications* have suggested that high fructose consumption may be a major contributor to the global epidemic of obesity. You are probably thinking: “How can that be…no one could eat enough apples to get fat!” But did you know that high-fructose corn syrup (HFCS) is the sweetener used in most (non-diet) soda pop? It is also used to sweeten jams, jellies, candies, and other ingestible goodies. Writing about this topic motivated me to rummage through my fridge to read the ingredient labels…my favorite raspberry jam listed HFCS second only to raspberries as the major ingredients of the product. As you probably know, soft drinks are the beverage of choice for many people. We consume these drinks more often and in greater quantities than ever before. Because of that, the consumption of HFCS has increased more than 1,000% since 1970. According to a study published in 2004 by George Bray and colleagues in the American Journal of Clinical Nutrition, HFCS now represents more than 40% of caloric sweeteners added to foods and beverages. It is the sole caloric sweetener in soft drinks in the U.S. These researchers estimate that the top 20% of consumers of caloric sweeteners ingest more than 300 calories per day as HFCS. That, for many folks, is about 15% of their recommended caloric intake. Since most soft drinks have no nutritional redeeming features, such as vitamins, minerals, protein, or fiber, HFCS sweetened soda pops bring a whole new level of meaning to the term “empty calories”. Fructose has a number of effects that make it a likely candidate to fuel the growth of obesity when consumed excessively. Besides being a significant source of calories, HFCS soft drinks have important metabolic effects that contribute to its impact on obesity. Regulation of eating and body weight is complex. Sensory cues, hormonal signals, and biochemical processes interact to help ensure living things take in enough food to survive. For example, the ingestion of glucose-containing carbohydrates leads to the secretion of the hormone insulin. Insulin has many different effects on our metabolism, but one that is relevant to obesity is its effect on appetite. Insulin acts on the brain to reduce food intake. Insulin also stimulates fat cells to increase production (about four hours after a meal) of another substance, called leptin. Leptin also acts on the brain to reduce appetite. A third hormone, ghrelin is produced by the stomach and small intestine. It stimulates hunger and ad lib food intake. Circulating ghrelin levels are inversely related to body weight and increase after diet-induced weight loss. Ghrelin seems to play an important role in weight regain after weight loss. So you can see that ingestion of certain foodstuffs, such as glucose-containing carbohydrates, trigger a number of responses that help to balance food seeking behaviors with whether an individual is fed or fasting. These complex processes interact to help us maintain weight over both the short and the long run. Fructose, unlike glucose, does not turn on these regulatory mechanisms, leaving individuals with high fructose ingestion vulnerable to overeating and weight gain. High fructose ingestion has other adverse health effects as well, including elevation of triglycerides (a coronary heart disease risk factor for some people), and an association with the development of insulin resistance and metabolic syndrome (high blood pressure, abnormal lipids, glucose intolerance, and central obesity). Bray and colleagues point out that the rapid rise in the rates of obesity since 1970 mirror the rapid increase in the consumption of HFCS. This does not prove that fructose is the cause of the obesity epidemic. However, when combined with our current understanding of the metabolic effects of fructose, it strongly suggests HFCS-sweetened soft drinks are contributing to the problem.